SecurityMetrics’s Guided HIPAA Compliance has earned the company a Best of State Award for HIPAA Compliance Services and makes it a tally of two recognition awards collected by the firm this year for its program. 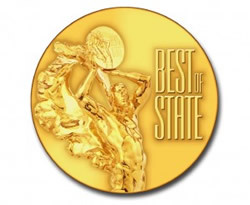 The “Best of State” Award is Utah’s most respected recognition and awards program. The awards aim to recognize the efforts made by companies in the state that have shown excellence in their field. Each nomination is assessed by a panel of expert judges who decide on the winners based on the usefulness of the product or service, how it benefits state residents and the level of innovation in its development. SecurityMetric was nominated in the Business Category for its Guided HIPAA Compliance program; a simplified risk-based approach that can help healthcare organizations improve security and comply with HIPAA regulations. The program is aimed at smaller organizations, which typically find it harder to achieve compliance. The program of pilot compliance audits conducted by the Office for Civil Rights in 2011/2012 showed that smaller healthcare providers struggled with all aspects of HIPAA. The program is therefore of benefit to these smaller players in the industry and helps them overcome some of the hurdles in the HIPAA regulations. SecurityMetrics compliance program offers consultations with live consultants who help organizations create evidence of good-faith efforts and achieve HIPAA-compliance ahead of the impending OCR compliance audits. To date the company has helped hundreds of Utah health professionals become compliant with HIPAA Privacy, Security and Breach Notification Rules, with growth of uptake of its program has risen by 218% between Q3 and Q4, 2013.